Maxime Mermoz made the difficult jump from French heavyweights Toulouse to their fierce rivals Perpignan and adapted to his new surroundings quickly to become one of the most impressive centres in the Top 14. Quick and compact, Mermoz possess a razor-sharp running game and instinctive skills in close-quarters. A first international cap came in 2008 as an under-strength side toured Australia and Mermoz's international career has been hampered by injury on a number of occasions. He started the 2009 Top 14 final as Perpignan defeated Clermont Auvergne, having made his Six Nations debut as a replacement against Scotland early in the year. He won two further caps on tour as France lost to New Zealand and Australia, but announced himself as a frontline player by winning the No.12 jersey for their victory over South Africa in November 2009. Injury ruled him out of the remainder of France's Tests again, though, and a shoulder complaint meant that he started 2010 on the treatment table. He missed the 2010 Grand Slam win through injury but made his way back into the France squad for the southern hemisphere summer tour. After starting the season in blistering form for Perpignan in 2010-11, Mermoz hoped to retake the centre spot for the national side. However, a shoulder injury brought an ubrupt end to his tournament with him being substituted 55 minutes in their opening game against Scotland. He went onto miss the rest of the tournament. But Mermoz propelled his way back into international recognition after being picked to play Ireland in France's first World Cup warm-up Test. 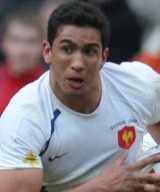 Mermoz went to the 2011 World Cup as part of Marc Lievremont's 30-man squad. While he played in six of their matches in New Zealand, the Perpignan centre found his game time limited under Philippe Saint-Andre with him turning out just twice for France in the 2012 Six Nations.